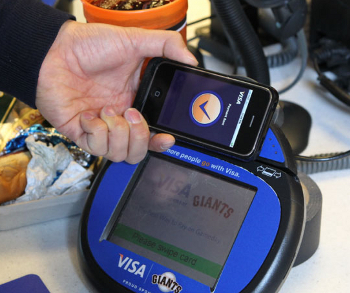 Seems like Square isn’t the only one that wants to enable credit card payments with the iPhone – Visa and a company called DeviceFidelity have just announced a new system that lets people with Visa accounts to simply wave their iPhone in front of a payment terminal (like the ones you use to checkout at the supermarket, see at right) to make a payment. Basically, the system, called In2Pay (horrible name) is exactly opposite of Square. With Square, it’s the merchant that has to add a dongle and app to their phone and the customer then swipes their credit card – notably just about any credit card – into the merchant’s phone. With In2Pay, however, it is the customer that has to download the app and get the dongle (which uses a microSIM card for some reason) and then swipe it across the the payment terminal. There are some obvious disadvantages to here to both the consumer and merchants compared to Square. First of all, as we said above, Square takes any credit card, which is a huge advantage. Secondly, with this system, both parties have to have special equipment, whereas with Square, only the merchant does. Third, we’re assuming that in order to get this on the merchant side, they’d have to have a merchant account (which no one likes), which is something that Square lets merchants avoid. Finally, while an Android app is certainly a possibility down the road, right now Square has one and In2Pay does not. One possible advantage that we can think of in the minds of some, however, may be in security. Some people might find the idea of sending their credit card info to Square as a bit too much and this solution would keep Visa card members mostly within the confines of the Visa system. This could be especially appealing for larger ticket purchases. However, for everyday purchases, the extra dongle will probably not be enough of an incentive for anyone to tote around (and for larger purchases you could just use your good old plastic instead of your phone). While any progress on making payments with a smartphone is news, right now, for both consumers and merchants, this solution from Visa just doesn’t compete with the simplicity and flexibility of Square. Read next: FTC Is On A Mission To Punish Google Before The Facts Are Dry On The Page?